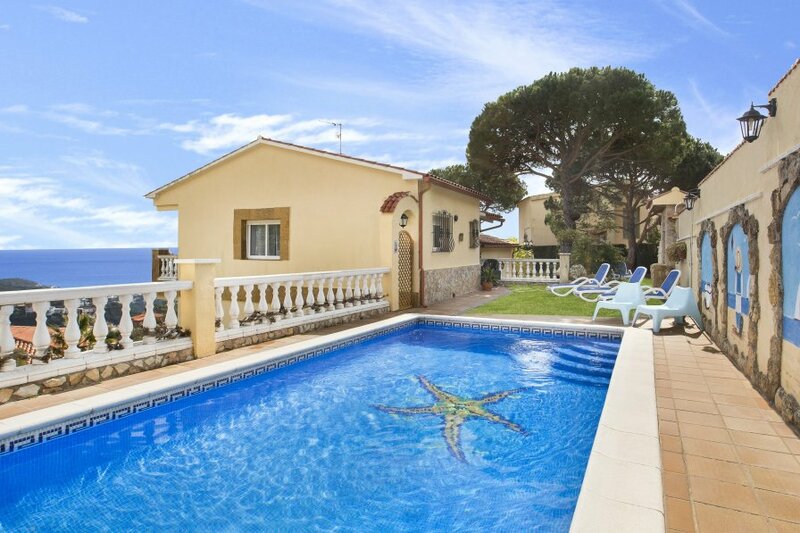 Villa Crisantemo, with a 100 m2 living area (+ 600 m2 plot), is located in the quiet area of Serra Brava 4 km from the beach of Cala Canyelles and 8 km from Tossa de Mar, ( 6Km from center of Lloret de Mar). This villa has a capacity for 6 people, and has 3 double bedrooms (2 doubles, 2 single beds), a living-room with satellite TV and HiFi, a kitchen (equipped with refrigerator, microwave, dishwasher and washing machine) and 2 bathrooms. Pool 8 x 4 m and private garden. From the terrace you can enjoy wonderful sea views. Optional heating. (not included. Extra price for using it: 50 eu / week). Free WIFI connection. The car is very recommended to could go to the beach and to the centre of the village, so this is not possible to go walking and there're no much buses in the area. The nearest beach Is Cala Canyelles, a pretty stretch of the Costa Bravas coast with 500m of the characteristic coarse white sand beach of the area. Umbrellas and deck chairs are provided to rent as well as activities like pedal boats, para sailing, and water- skiing and canoeing. Also you can taste the Mediterranean food, fish and paellas, in the restaurant placed on the beach. This use to be rented to families. in case of young people, is necessary to inform us before doing the booking, to could confirm the possibility to the owner.THIS HOUSE IS ONLY RENTED TO FAMILIES.`GROUPS OF YOUNG PEOPLE ARE NOT ACCEPTED.